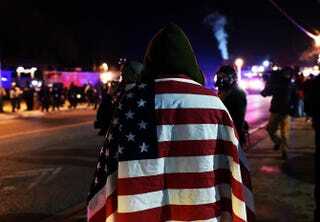 A protester wraps himself in a U.S. flag in Ferguson, Mo., Nov. 25, 2014, during demonstrations a day after violent protests and looting following the grand jury decision in the fatal shooting of 18-year-old black teenager Michael Brown. It used to happen every Fourth of July. Our homeowners association would place little, cheap American flags on each lawn, and every year, ours ended up in the trash. Every. Year. My parents—born in America, raised in America, the only country they’ve ever known and will know, who had no desire to leave and will die here—were only outwardly patriotic about once every four years, when the Olympics were on. And even then, that was more of a benign nationalism. My parents, like countless others who were part of America’s outsiders trapped on the inside, had a complicated relationship with their mother country, especially since their mother country was also an abusive neglecter who constantly victim-blamed. “Why are you hitting yourself?” was her motto as she crafted an environment ripe for self-inflicted wounds. You don’t get to choose your parents. Or your country. My parents, like millions of other black people, were just here, descendants of Africans brought here against their will, then told that they must love this country and their oppressors, no matter what horrors were inflicted upon them. Slavery. Segregation. Jim Crow. Lynchings. Bombings. Beatings. Discrimination. For those unwilling to face what our country has done in the name of “liberty” for some, they charge black Americans a price for acceptance—for patriotism—and that price is to forget the pain inflicted. Forget the anguish. Let it wash away with your patriotism. You can’t love America and hate her ways. You must eat the whole of our union, consume it, even if it renders you sick. Why do you people hate America? My parents were supposed to get over segregated water fountains and the abject poverty they were raised in. My sisters and I were supposed to forget how, even today, there are neighborhoods in our hometown of St. Louis where black people simply don’t go. From Rodney King to Michael Brown, we were supposed to get on board the “I Love America” train and leave our pain in the rearview. But our family couldn’t. We would be good citizens and productive members of society, but we weren’t going to pretend the bad things didn’t happen. Patriots we were, but our loyalty could not be forged out of ignorance. And yet, forgetting America’s transgressions against black Americans is what is asked of us by those who appoint themselves protectors of America’s history. These are the individuals who dislike the ugliness of America’s past but can’t reconcile that we live in an ambitious, prosperous and plentiful country founded on contradictions. Founded on “all men are created equal … except for the slaves I presently own as I write this.” Founded on liberty, thievery and free labor. These are the people who try to rewrite textbooks and silence critics, painting them as un-American for daring to remember things that “happened so long ago.” Or things that happened 50 years ago, like “Bloody Sunday” in Selma, Ala. Or people who remember things that happened five minutes ago, like another young black man shot and killed by a police officer. Case in point: an Oklahoma Republican who thinks American history has an anti-American slant: “In essence, we have a new emphasis on what is bad about America,” said state Rep. Dan Fisher, the measure’s chief sponsor. “[The new framework] trades an emphasis on America’s founding principles of constitutional government in favor of robust analyses of gender and racial oppression and class ethnicity and the lives of marginalized people, where the emphasis on instruction is of America as a nation of oppressors and exploiters,” Fisher lamented at a legislative committee hearing a few months ago. This reminds me of a story my father tells about a white person saying that black parents teach their children to hate white people, ignoring that racism does a good-enough job of that. Who needs to teach a “Whites Only” sign? That is what Giuliani’s subtext is. How can someone like Obama love America, someone black? Because black people, like my father, are not always outwardly patriotic. But then that raises the question, what does being black have to do with not loving America? That then leads to how black people sure do seem awfully angry at America all the time, so they must hate it. But then the thinking stops because no one wants to touch on why black people are always so angry, because all the reasons are painfully legitimate and if you actually consider them, good lord, you may have to do something about it. It’s much better to believe the fantasy of perfect America than to confront that truth, the truth that politicians are trying to strip from textbooks. The truth Giuliani is clumsily trying to silence. But what critics like Giuliani and those who seek to whitewash history don’t get is that you can be a patriot who doesn’t want that plastic “Made in Taiwan” flag on their lawn. You can love someone who hates you. The 50th anniversary of Bloody Sunday in March was a reminder of that. In 1965, hundreds of black people gathered on the Edmund Pettus Bridge who just wanted to be heard, even though they knew there was a 99.9 percent chance they’d be taking their own lives into their hands. They did it anyway, out of love. Love for a better future. Love for a better life. Love for America’s unique ideals that sound so good on paper. What if it was more than paper for us, but real? they thought. Let’s all take a billy club to the head for love, to prove we should have the same rights and protections as all the citizens America purports to love. The patriotism of a black American is the patriotism of someone who loves America even though America has violently not loved that person. It is a one-sided love, so you dispense with the cheesy T-shirts and flag pins. Those don’t really mean anything anyway. Anyone can wear a T-shirt. But what are you willing to do to prove that love? We wear an unrecognized shirt of patriotism, red with freshly spilled blood, white with the color of our broken bones. We deal not in empty words but in actions, challenging America to live up to its dream and be for the prosperity of all. Black people love America, even when we hate it, because we’re willing to go through just about anything to be part of this idyllic dream that taunts us, a dream promised in a place that was not made for us. We’ve shed blood overseas in wars where our participation was not wanted. We’ve shed blood in the streets on our hometowns. And we’re still here. Still negotiating. Still organizing. Still trying to create change through the very American notions of free speech, civil protest, organizing and elections. Any other country with less-democratic ideals that had this large a racial underclass would have faced prolonged warfare, not marches and legislation. And yet the tools we’ve chosen to fight for our country are made out of the very ideals it claims to uphold. Even in the streets of Ferguson, Mo., last year, the scariest part was the militarization of the police and some looting. Other countries get prolonged bloody insurgencies and genocide. But this is America, the country we love, so even when we fight it, we fight on the foundation of its founding. We fight it in love. If that isn’t patriotism, I’m afraid that too many don’t know what patriotism is. Editor's note: This article was first published in March for the anniversary of the Selma march.